Vancouver’s manager of active transportation was in town this week to promote similar efforts in Halifax. 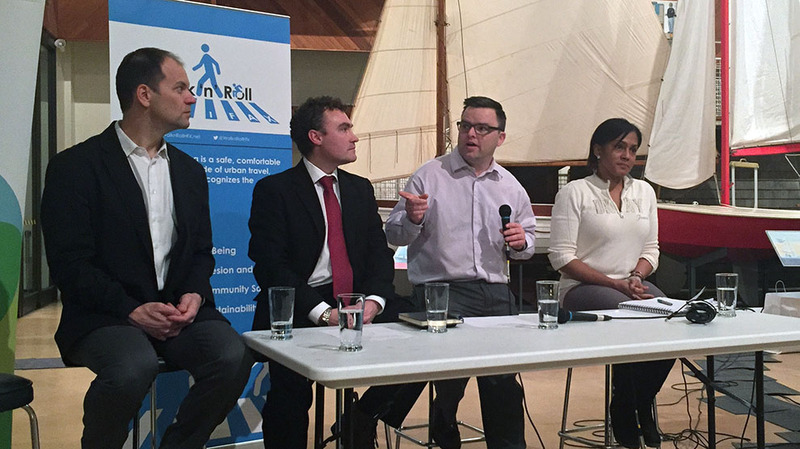 Dale Bracewell gave a lecture Wednesday evening and participated in the Passion for Place public lecture, hosted by Walk n’ Roll Halifax, the Halifax Cycle Coalition, the Planning Design Centre and the Halifax Regional Municipality. Braswell says Halifax and Vancouver actually have a lot in common in regard to active transportation. Both cities are coastal, both cities have a similar sized core and both cities have a relatively flat topography. And 20 years ago, Vancouver didn’t have much in the way of active transportation networks either. “It’s the right time for all the city and its partners to go and implement a great active transportation network,” Bracewell said. The event was standing room only, with more than a 100 people in attendance at the Maritime Museum of the Atlantic. On the panel with Bracewell was Bob Bjerke, Chief Planner for the Halifax Regional Municipality, Brendan Maguire, MLA for Halifax Atlantic, and Dr. Gaynor Watson-Creed, Medical Officer of Health for the Nova Scotia Health Authority. During the panel and Bracewell lecture, there was consensus that advertising the health benefits of active transportation should be a key selling point. Watson-Creed had a simple advertising plan she hoped would make Haligonians healthier. She said that if the city and interested groups — like the ones hosting the panel — were to advertise greenness, the public would be more open to adopting it. Vancouver has been publicly advertising its goal to be the world’s greenest city by 2020 and that has become part of Vancouver’s psyche, she said. Everyone there agreed if there was a proper network, it would be used and maintained. Local non-profit planning firm PLANifax also stressed health benefits in a video it made to open the event. Bracewell emphasized that the business community needs to be sold as well. “The key is to not matter how fast you want to be able to implement. Always take some amount of time to genuinely do some engagement with the businesses and the adjacent landowners,” Bracewell said. I would also add that the burgeoning number of seniors suggests that public transport will continue to create pressure for transit, but will the city respond? The cockeyed expensive “study” and hidden replies suggest that city has made up it s commercial mind and opted against service. And yet Halifax wants to remove routes and spend the money on “enhancements” for the downtown bunch. People who rely on busses for work, medical visits, school events and potentially use of parks and recreation are to be sent to cars ot left home for not having enough numbers to pass some undefined ” usage” test. Despite growing suburban growth. It would be nice to think that Vancouver s approach would be adopted but so far Nova Scotia leadership does not inspire much hope.